This square was created with baby projects in mind, although it would also be useful for making projects for older kids and perhaps even tweens and teens (particularly tween/teen girls.) There are many creative ways to use this design. Yarn: You'll need 3 different contrasting colors of yarn or crochet thread -- Color A, Color B, and color C. You can use just about any yarn or thread, although you'll need to use a smooth worsted-weight yarn to achieve results similar to the sample project pictured. Crochet Hook: You'll need a crochet hook that's suitable and comfortable for use with your chosen yarn or crochet thread. Feel free to consult your yarn label for suggestions, although you should also use your own good judgment about whether the work looks good when you are using that particular hook size. Other: Tapestry needle for weaving in ends. ch-2 sp = chain-2 space. In this pattern, a chain-2 space is defined as being the space formed when you worked 2 chain stitches to form the corner in the previous round. Row 1: sc in 2nd ch from hook and ea st across the row for a total of 5 sc sts. Row 2: ch 1, turn. Work 1 sc st in ea st across the row for a total of 5 sc sts. Row 3: ch 1, turn. Work 1 sc in ea of the first 2 sc sts. Create your flower center in the next st: work 5 sc sts. Drop the active loop from your crochet hook. Insert your hook from back to front into the first sc st in your group of 5. Grab your dropped active loop and pull it through to create a tiny popcorn. Then work 1 sc st in ea of the last 2 sc sts across the row. You'll end up with a total of 1 popcorn in the middle and 4 sc sts total, 2 on ea side of the popcorn. Rows 4-5: ch 1, turn. sc across the row for a total of 5 sc sts. At the end of row 5, change colors to color B. Cut color A, leaving a tail of yarn for weaving in or crocheting overtop of. Round 1: Using color B, ch 1, work 5 sc down the side of your piece, ch 2 to turn the corner, work 5 sc across the lower edge of the piece, ch 2, work 5 sc up the other side of the piece, ch 2, work 5 sc across upper edge of piece, ch 2, sl st to join to the first sc st in the round. Leave a sufficient amount for using this tail for both stitching squares together and weaving in at the same time. If you choose this option, you'll need to leave a longer tail than usual. Round 3: This is a different sort of round. In this round, you'll be working surface crochet slip stitches in a way that's just a little bit freeform. This might seem kind of weird and unstructured, but you can do it! Make a slip knot using color C. Insert your hook from right side of work to the wrong side, close to the center popcorn. Grab the loop from the slip knot with your hook and pull it through to the surface. Work a round of 6 surface crochet slip stitches, arranging them in a ring around the center popcorn. The first stitch and the last should be close enough to touch each other. End off, but continue using color C.
Round 4: You're going to create your three-dimensional flower by crocheting into the round of surface crochet sl sts that you just created. Join color C as follows: make a slip knot of the yarn on your hook. Remove the slip knot from your hook, being careful to keep it intact. Insert your hook into any of the surface crochet sl sts worked in round 3. Place your slip knot back onto the hook and pull the active loop up through the sl st. [ch 3, dc in same sl st, ch 3, sl st in same sl st, sl st in next sl st.] Rep the sequence in brackets all the way around for a total of 6 flower petals. End off. Weave in all loose ends -- with one exception. You might wish to use your loose end of color B for sewing your squares together later when you make a larger project. If so, skip weaving that one in and do all the others. 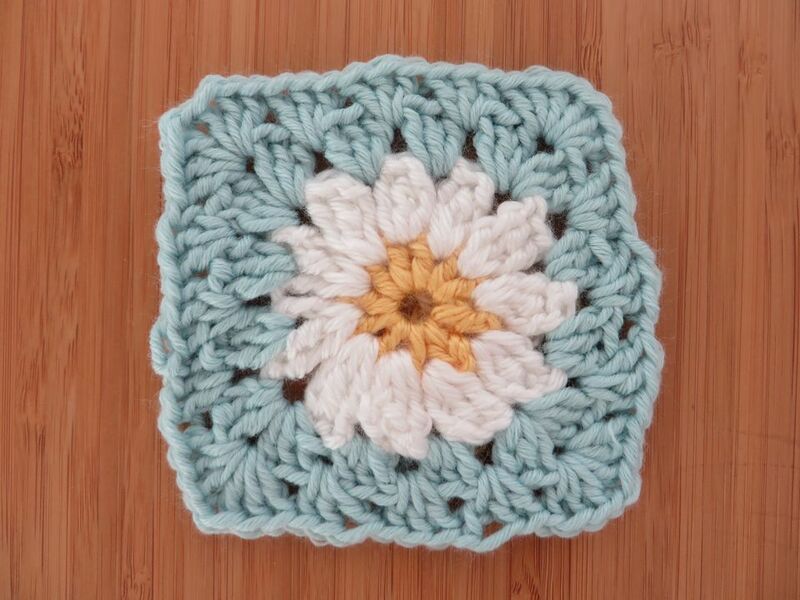 If you don't already know how to join granny squares, don't worry, here's how to do it. There are different ways you can approach this task, so take a look at the list of possibilities and check out whichever tutorials interest you. If you aren't sure which method to use, a favorite is the whip stitch. You could try that one if you are agreeable to the idea of sewing your squares together. If sewing isn't for you, and you'd rather crochet your squares together, try the slip stitch join instead. For this small square, the single crochet join might be a bit overpowering, although it is also an option.